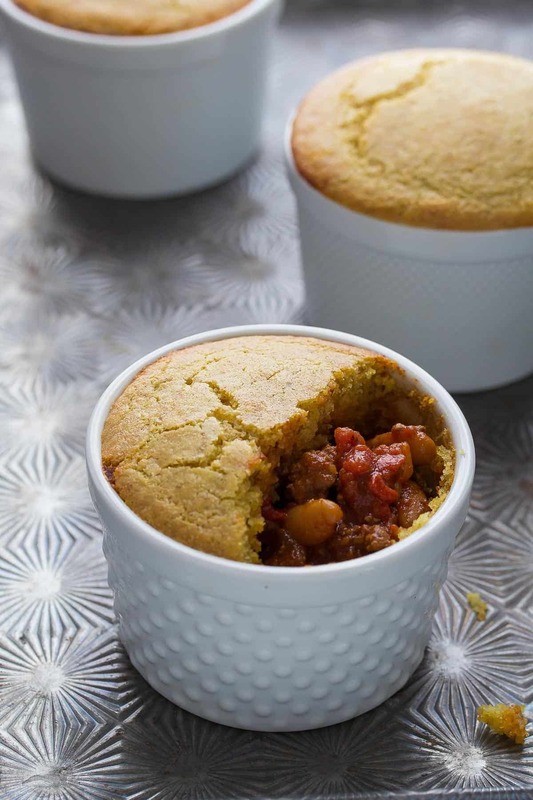 An easy weeknight recipe for chili pot pies: use up your leftover chili by baking them up in individual portions, topped with a delicious cornbread crust! Note: This is part of a series where I provide a base slow cooker recipe and three ways to enjoy the leftovers. 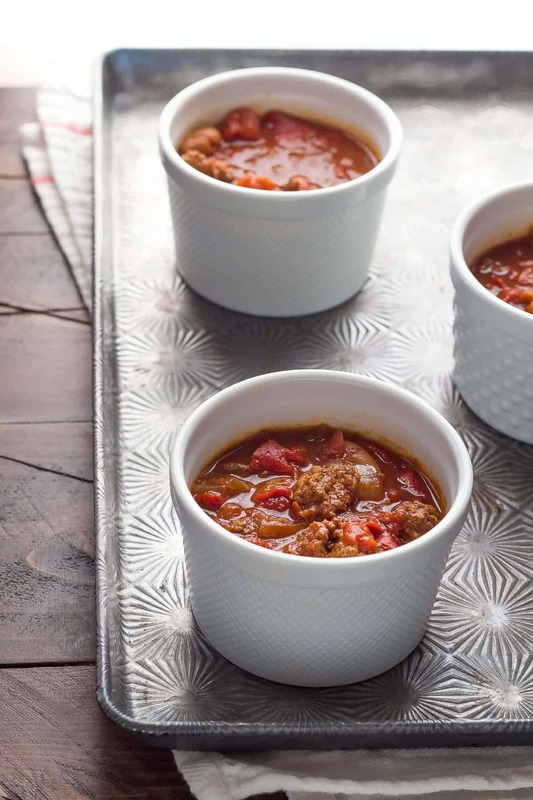 For the base Slow Cooker Roasted Red Pepper Chili, go here! I’m back with the third recipe in our 3-in-1 chili series! 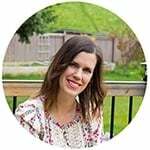 On Monday, I shared my recipe for Slow Cooker Roasted Red Pepper Chili, then yesterday I shared my ‘recipe’ for Leftover Chili Potato Nachos (although admittedly it barely qualifies as a recipe 😀 ), and today here we are again. 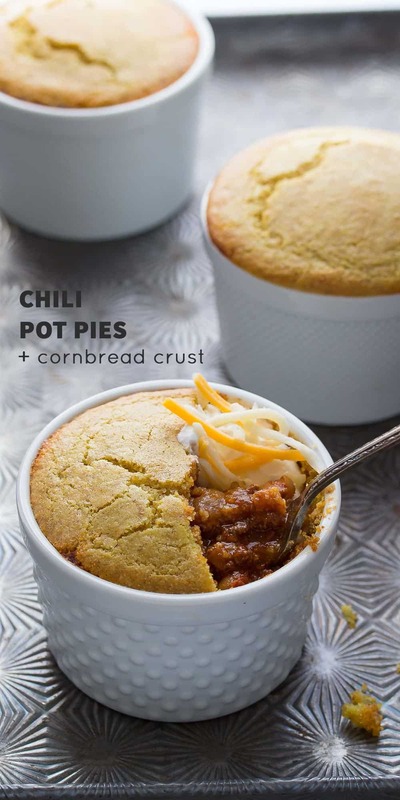 With more chili…in pot pie form! In case you think I am crazy for chili, it’s actually kind of the opposite. I do like chili. The first day you eat it. That’s pretty much where it ends. Leftovers? Not quite as exciting. 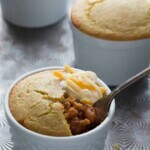 If you’ve read my blog for a long time…and I mean a LONNNNNG time….then you know that I used to have a recipe for chili pot pies. I took it down ages ago because A) I wasn’t super happy with the flavor of the chili and B) The cornbread crust was just not my favorite. For the cornbread crust, I adapted my favorite cornbread recipe, which is from Javas, an awesome coffee house/restaurant I used to work at back in the day. It is fluffy, moist, and has a touch of sweetness to balance out the savory chili! Best of all, this recipe is ready in just over 30 minutes. SO fast and so easy! Happy Wednesday, friends! We are half-way to Friday!!! Hi Judy, I believe that would work just fine! I’d make sure to have them on a baking sheet just in case it overflows 😉 Let me know how it turns out! YES! I love the cook once eat twice technique 🙂 Thanks, Andrea! can this recipe go without the wheat germ? will that effect the amount of flour? Hi Angie, my apologies for not replying sooner. I haven’t made this recipe without the wheat germ, but it is my understanding that you would need to replace it with flour. I would think you would replace it 1:1 but I’m not 100% on this. If you try it, it would be great if you’d report back how it worked out! I know this is very easy as-is, but I have a package of cornbread mix I’ve been wanting to use up. Do you think I could use that over the chili? Hi Chelsea! I really can’t say for sure. You could try it and scoop the same amount of cornbread batter as I’ve mentioned in the recipe, but I would definitely put a cookie sheet underneath them. I think it should work, worst case scenario it will run over and (maybe) burn on the cookie sheet? 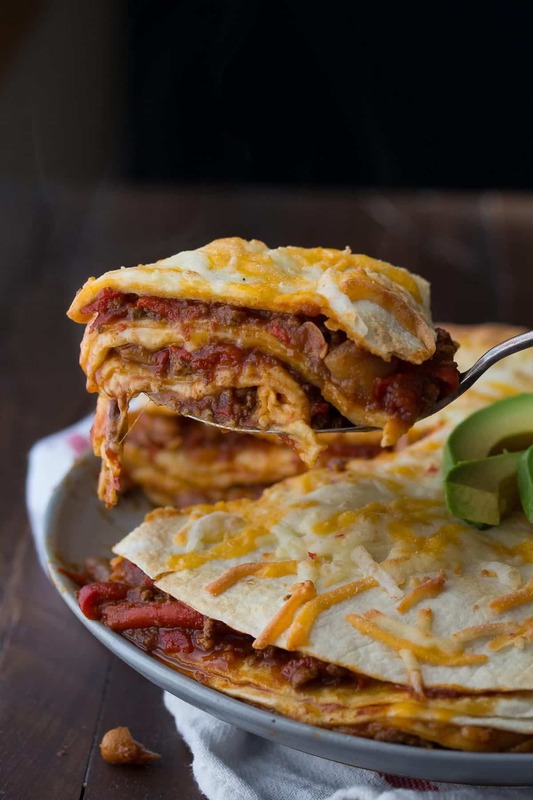 Wow what a fun way to use leftover chili! looks very delicious! I love this!! the cornbread on top is genius!! Oh my! That cornbread crust!! I LOVEEE that idea! 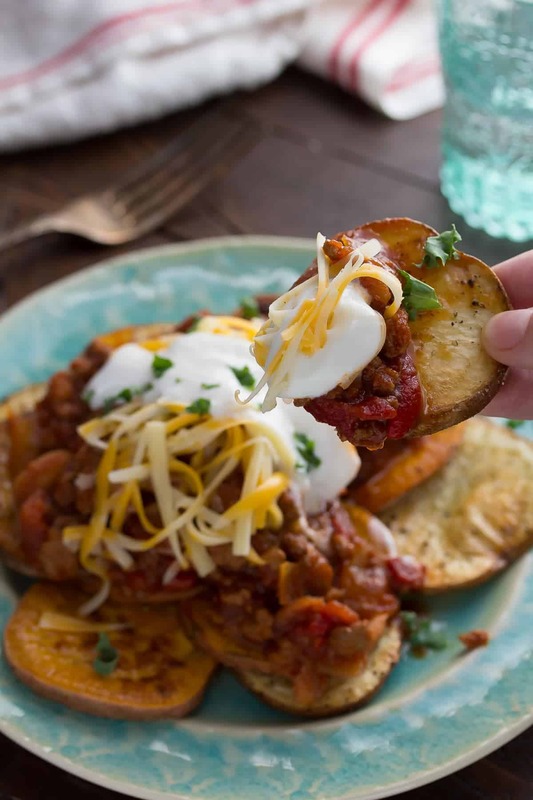 This is such a fun way to use leftover chili! 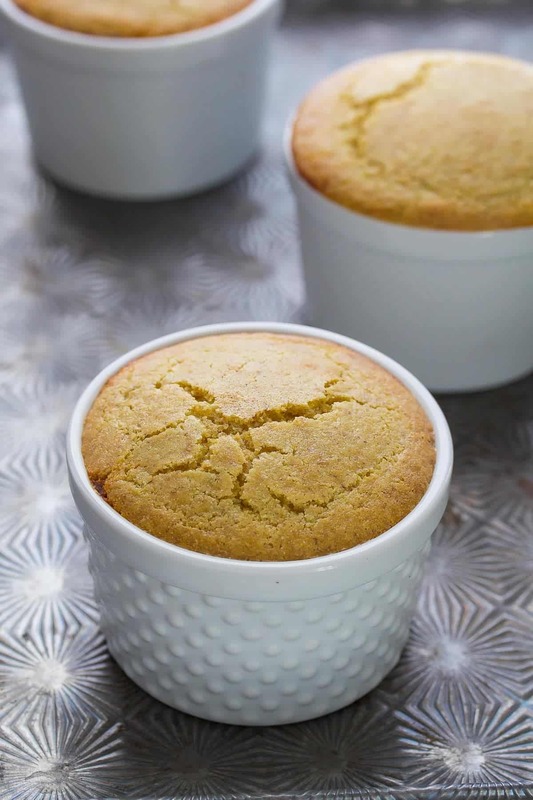 If you’re going to have your cornbread anyway, why not bake it on top?? Love this idea and I can’t wait to try it! Your series are totally genius, Denise! I actually have left over chili in the refrigerator right now and these pot pies look like the perfect way to use them up! LOVE that they are individual size, because this chic doesn’t like to share! 😉 And that cornbread crust looks delicious! YUMM! Cheers, doll! You are way too sweet, Cheyanne 🙂 I feel like I always end up with leftover chili and don’t want to eat it as is! Cheers and happy weekend! What a great series!! 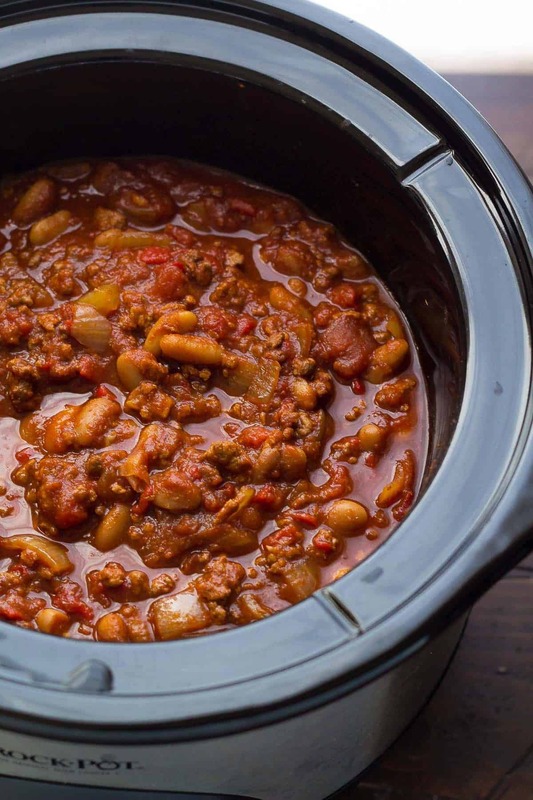 We make a lot of chili and just freeze leftovers but these are exciting ways to use that! 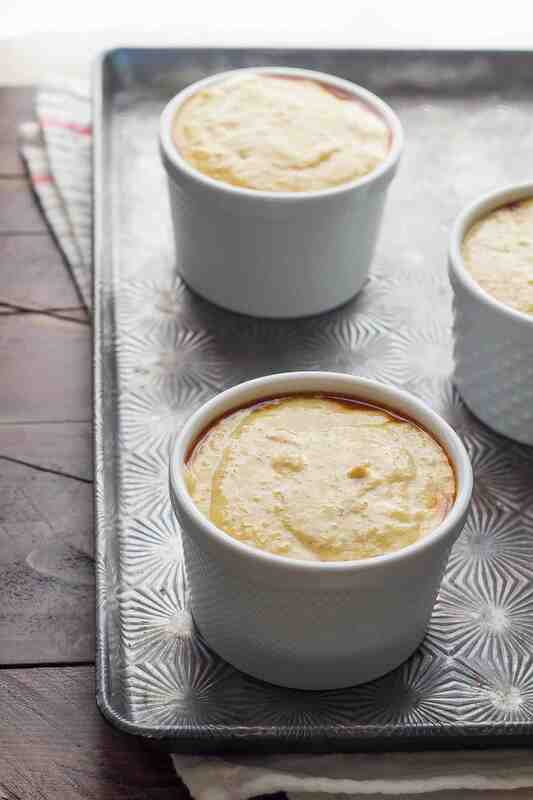 Love the cornbread topping here! It does freeze so well, doesn’t it? Thanks so much, Zainab! Hi Rhonda, I’ve never tried freezing them, and really can’t say. I don’t think the cornbread would hold up well baked or in batter form. Let me know if you try it! I make something almost EXACTLY like this for my family! The personal-size is just so fun and everyone always loves it! I mean, it’s both chili AND cornbread in mini size, so how could you ever go wrong?? I’m definitely going to have to try your version! I like the personal size because it’s the perfect portion size…I always take too much 🙂 Thanks, Sarah! I love these! So fun with a cornbread crust. Definitely trying this winter!